Egypta : Myth, Magic, and Mystery is a dance drama depicting the history of Ancient Egypt. Conceived and choreographed by Dr. Laurel Victoria Gray, the concert work grew from a suite of dances she created in 1995 for a German ensemble. The concept continued to evolve and development when she set the pieces on her own ensemble, the Silk Road Dance Company. In 2003, Gray was awarded a grant from the Kennedy Center Local Dance Commissioning Project to create new works for Egypta, creating an evening length dance concert. 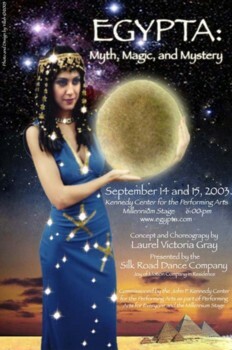 The new version of Egypta premiered at the Kennedy Center for the Performing Arts on September 14 and 15, 2003.